A BRITISH SOLDIER who shot dead a 15-year-old boy in Derry on 31 July 1972 is to be charged with murder, the Public Prosecution Service has said. The family of Daniel Hegarty were informed today of the decision to press charges against the soldier – identified as Soldier B.
Hegarty was shot twice in the head during Operation Motorman, which saw thousands of British soldiers enter “no go areas” in Belfast and Derry. His cousin Christopher Hegarty, who was 17 at the time, was also shot and injured in the incident. After meeting the Hegarty family today, director of public prosecutions in the North Stephen Herron said he had given “careful consideration” to all available evidence before reaching his decision. As with all cases, I have also carefully considered whether the public interest requires prosecution through the courts. Particular consideration was given to Soldier B’s ill health, regarding which an updated medical report was obtained. In line with our Code for Prosecutors, I have concluded, given the seriousness of the charges, that the Public Interest Test for Prosecution is also met. “I have therefore taken the decision to prosecute an individual identified as Soldier B for the offence of murder in relation to the death of Daniel Hegarty and for the wounding of Christopher Hegarty,” Herron added. An inquest into Hegarty’s death in 2011 found that the boy “posed no risk” when he was shot. The decision to press charges now reverses a previous decision not to prosecute any soldier over his death. 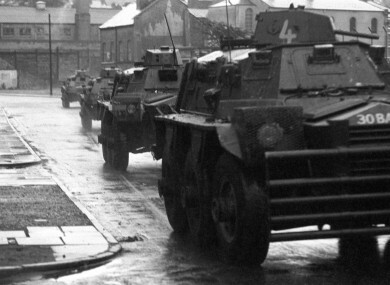 Last month, the PPS announced that a former British soldier is set to be charged in relation to two murders in Derry on Bloody Sunday in January 1972. SDLP Leader Colum Eastwood MLA welcomed the decision by the Public Prosecution Service to proceed with a case against ‘Soldier B’ for the murder of Daniel Hegarty and wounding of his cousin Christopher. The Foyle MLA said that the Hegarty family “deserve justice and accountability” for what happened to Daniel. Email “Former British soldier to face murder charge over 15-year-old boy shot dead in Derry in 1972”. Feedback on “Former British soldier to face murder charge over 15-year-old boy shot dead in Derry in 1972”.